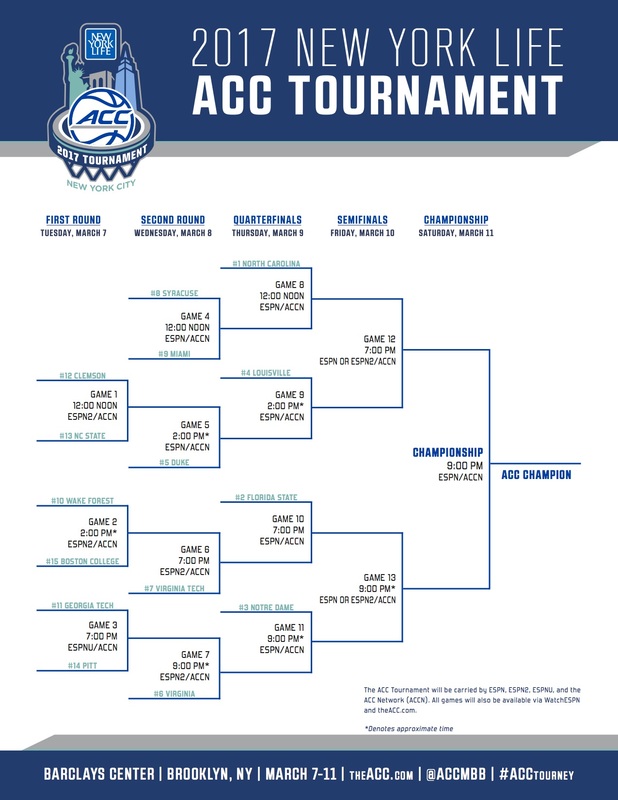 The Atlantic Coast Conference men's basketball tournament begins on Tuesday. The 2017 Atlantic Coast Conference Men's Basketball Tournament will be played from March 7-11 at the Barclays Center in Brooklyn, with the tournament champion receiving an automatic bid to the NCAA tournament. North Carolina won last year's tournament, and proceeded to reach the National Championship Game. If the Tar Heels win this year's tournament, they will be tied with Duke for most tournament titles in ACC history. The conference could see as many as 10 teams enter the NCAA Tournament as several teams, such as Syracuse, Wake Forest and Clemson, remain on the bubble.